Corrugated Cardboard is the most common packaging material that many companies and industries choose to use. Cardboard is a stiff, strong and light-weight material normally made up of three layers of brown kraft paper. The way it is constructed ensures cardboard is very customizable, can carry a wide range of weights, can protect against moisture, is a cost-effective type of packaging, is from a sustainable source and is able to be recycled effectively. 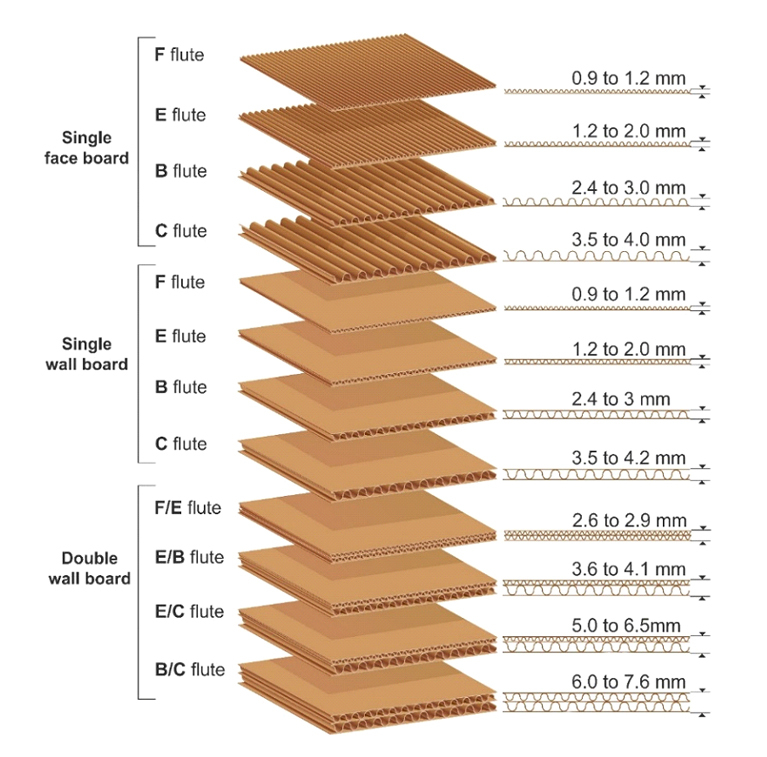 Corrugated Cardboard is constructed using engineering principles. Arches have been used by Architects for thousands of years for spanning a given space. An appropriately curved arch is the strongest way to span a gap. Corrugated Cardboard consists of an arched or fluted corrugated sheet of paper sandwiched between one or more flat linerboards. The arches or flutes in the inner layer resist bending and pressure when glued to the outer layer and give the cardboard strength which enables it to carry more weight. The arched design also creates an air space that acts as a cushion for the goods inside the cardboard box and some protection from impact damage. This space can also serve as an insulator, providing extra protection against changes in temperature. The basic material used to make corrugated cardboard is paper. The paper comes from the paper mill in large rolls which are loaded into a Corrugator. A Corrugator is a very large and long machine which can work at very high speeds. The Paper used for the inner layer is thinner and ripples easily. 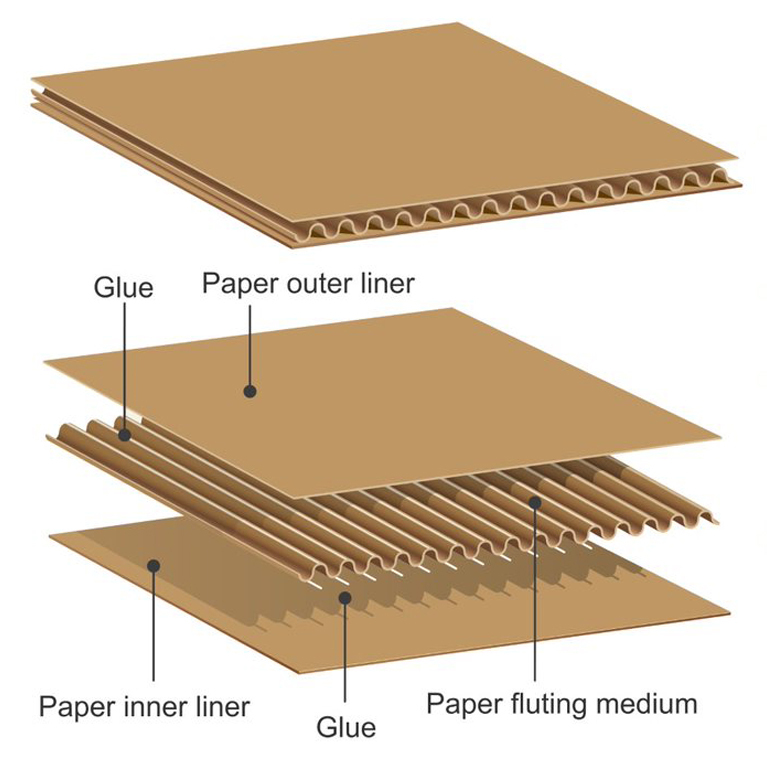 The Corrugator crimps or flutes the paper, using heat, before it is glued to an outside layer of thick paper. The corrugated paper once bonded to the outer liners will form the center of the cardboard and give it it’s strength. When the layers are combined the board resists bending. Once the materials are bonded the Corrugator cuts the cardboard to the required width and length. Cardboard can be made into different layers for heavier, stronger cardboard. Triple Wall Board is strong enough to be a substitute for wooden crates and can be used in the shipment of sensitive chemicals or industrial equipment. 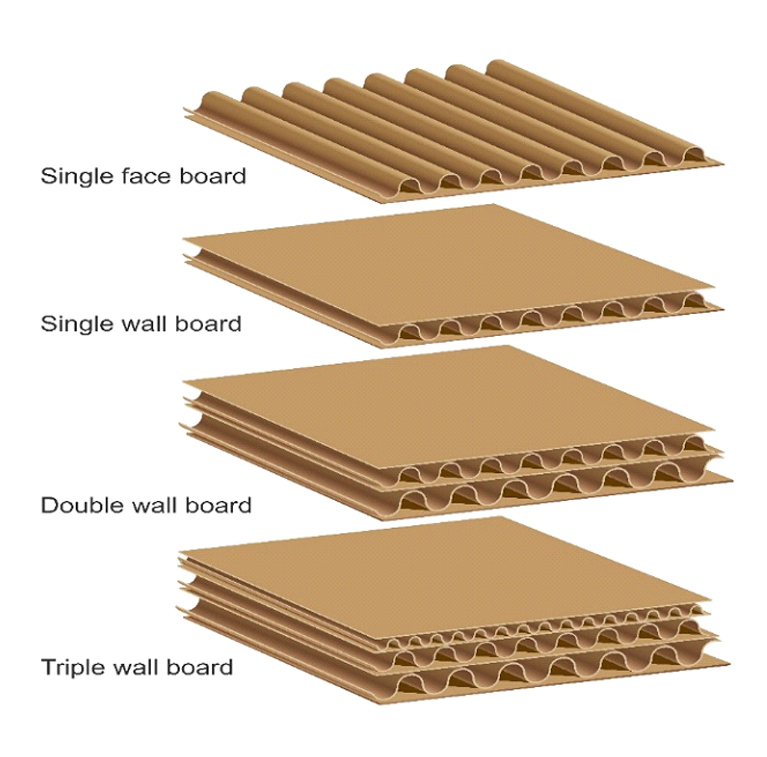 Cardboard can vary in size and thickness with different combinations of liners and flutes. The most common flutes are B, C, E and F Flute. They are determined by the flute height and the flutes per metre. Special flutes have been created that can compete in the boxboard market. Larger flutes have greater strength and cushioning while smaller flutes have structural and printability advantages for retail packaging.